Orange County Choppers is a family owned custom chopper business that spawned from the Teutul family’s other family owned business, Orange County Ironworks. Paul Teutul Sr. is the owner of both businesses and he runs the chopper business with his son, Paul Jr. who is the chief designer of the choppers. OCC jumped into the Chopper scene in 1999, with a bike that was built in Paul Sr.’s basement. The True Blue made its first public appearance with the Orange County Choppers at the Daytona Biketoberfest. This one of a kind custom made chopper was an awesome reference to a well made classic chopper. To name a few of the other well known creations by OCC you could check out the Spider bike, which has been purchased by Wyclef Jean of the Fugees (above). Orange County Choppers also created what is known as the Jet Bike to honor the military forces that fought in Afghanistan. OCC Jet Bike was featured on the American Chopper television show which aired in September of 2002. And most recently OCC designed a chopper with a theme based upon soldiers missing in action (MIA's). Paul Senior desinged it himself. OCC has received worldwide praise for their creation of custom motorcycles. Orange County Choppers have been awarded as one of the top twelve builders of motorcycles by American Iron. They were also chosen as one of three in a worldwide competition in Dayton, Florida. Having received many awards for their outstanding designs, OCC has been featured on numerous magazine covers to publicize their company for the magazines. Their unique design and flare has raised the bar for custom chopper builders world wide. If you are as big a fan of OCC as I am then I KNOW you'll want one of their t-shirts. Take a look on Amazon for some good deals. The only thing more impressive than the awards they received is the amount of fans Orange County Choppers have throughout the world. 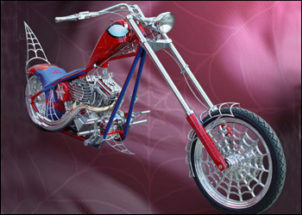 They have been featured with nineteen other motorcycle companies, the top builders, showcasing the Art of the Chopper. Orange County Choppers have obviously shown they are one of the top custom motorcycle companies in the nation, if not in the world. They have proven that they are the best of the best when it comes to custom cycles. Also, our FREE quality newsletter "Custom Chopper Mistakes" has tips, reviews, pictures, and special deals you are sure to enjoy. And we don't sell your name or email address to companies. We only send solid chopper information. Click here to sign up now.